Classes at Aikido Warrior Dojo are typically dynamic with an emphasis on martial integrity, uke arts (including defensive falling) and honest practice. O’Sensei, the Founder of Aikido, was a strong believer in the concept of joyous practice and this principle is highly valued at our dojo. Classes are designed to be accessible to everyone and time is set aside to give focussed training for beginner and senior levels. Safe practice is a priority. Our dojo prides itself on being an inclusive and non-discriminatory dojo. Students from other martial arts and Aikido schools are always welcome. While each class differs, training typically involves some or all of the following. In every class, time is set aside to warm the body and prepare for more vigorous training. Pre-set exercises are performed at the beginning of each class. A strong emphasis during these exercises is the maintenance of central equilibrium in our body structure, including an awareness of weigh distribution, toppling points, relaxed power, “heaven-man-earth” principles, subtleness and speed. The skills developed during the preliminary exercises directly translate to the more dynamic practice that is to follow. Uke arts include defensive falling (ukemi) and other skills necessary to receive a technique and give a sincere and honest attack. Uke arts are given a high priority at our dojo. It is appreciated that the idea of learning to roll and fall from techniques can be particularly daunting to new students. Time is taken to ensure all students are given the opportunity to learn to roll safely at their own pace. The method of defensive falling taught and practiced at our dojo is broadly based on the Donovan Waite method. This method has been selected on the basis of its martial relevance and its suitability for all age groups including older martial artists. With committed practise, students develop and improve their falling and rolling skills to the point where they become second nature. Aikido techniques include throws, holds, pins and atemi (strikes). Aikido techniques are designed to neutralise an attack with the least amount of injury possible to the attacker. 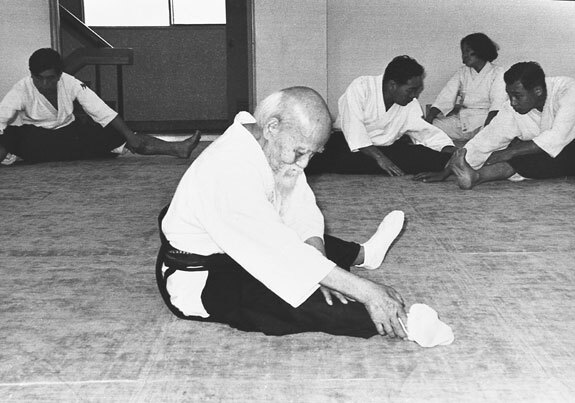 Understanding of body movement, including toppling points, appropriate spacing and other skills are critical for Aikido to be performed effectively. Initially, students learn to parry, neutralise and transform attacks such as grabs and basic strikes. As students progress, they learn to deal with a wider range of attacks, including unarmed strikes and strikes where the attacker is armed with a tanto (wooden knife), bokken (wooden sword) or jo (staff). Students also learn skills to deal with attacks while kneeling against both a standing attacker (Zagi handachi) or another kneeling attacker (zagi). While not typical of all Aikido dojos, techniques are practised under resistance and in the more free flowing forms. Atemi (strikes), ground work and responses to non traditional attacks are also studied. There are numerous reasons for this, not the least of which is that it allows students to confidently use Aikido as a complete system of self-defence. Students also develop and practice their techniques in free form single practice, referred to as taninzugake. For senior students, the option of free form practice against multiple attackers is available as well. Solo kata practice in the use of the Bokken (wooden sword) and the Jo (staff) is an important part of Aikido. Skills acquired through committed weapon practice translate directly and positively to improving our unarmed techniques. Benefits of weapons practice include the development of correct posture, calmness of mind, foot work, atemi (striking), moving from one’s centre, coordination, focus and calmness of mind, energy extension and general fitness. A unique feature of our dojo is that we include heavy bokkens in our weapons training. The reasons for this are discussed in the article Pass me a bokken …better make it a big one.